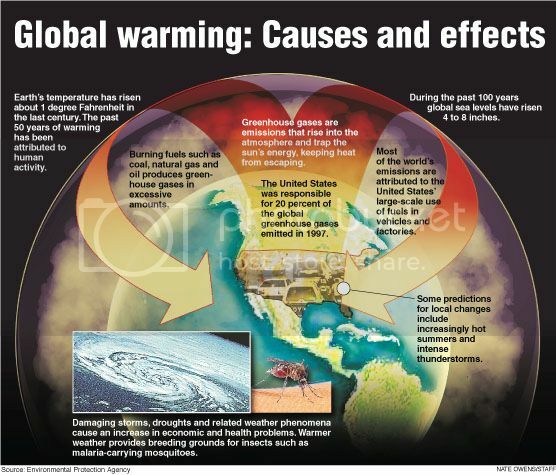 Global warming is perhaps the most important environmental problem in the world today. Levels of greenhouse gases are increasing in the atmosphere due to human activities, and are changing the composition of the atmosphere and global warming. Climate scientists agree that human activities such as the burning of fossil fuels contribute to the problem. The Intergovernmental Group of Experts on International Climate Change (IPCC), an organization of more than 2000 climate scientists , has produced three scientific assessments concerning climate change and, in each, has concluded that global warming occurs, and is related to human activity. Their latest report (January 2001) stated that: "There is new and stronger evidence that most of the warming observed over the last 50 years is attributable to human activities." The US National Academy of Sciences (NAS) concluded in June 2001 that: "Greenhouse gases are accumulating in Earth 'atmosphere as a result of human activities, causing air temperatures on the surface and subsurface of the Ocean temperatures on the rise. Temperatures are, in fact increasing. "And he added: " national policy decisions made now and in the longer-term future will influence the extent of any damage suffered by vulnerable populations and ecosystems later in this century. " The World Meteorological Organization (WMO) issued an unprecedented alert in July 2003 warning that " Extreme weather events Might Increase "in the world. The alert tied a record number of extreme weather events such as tornadoes and heat waves in 2003 to global warming. The alert said: "Record extremes in weather and climate events continue to occur around the world. Recent scientific assessments indicate that, as the global temperatures continue to warm due to climate change, the number and intensity of extreme events might increase. "Here in the United States, some states are taking action. The private sector is also responding to this challenge. * Coastal erosion, and loss of coastal ecosystems. While a handful of skeptics continue to discuss science, the World 'scientists agree: science is in. Global warming is happening. What is the United States about global warming? The Bush administration, unfortunately, has turned its back on this problem. Shortly after taking office in 2001, President Bush went back on a campaign promise to regulate carbon emissions from the power plants (a major source of pollution to global warming). The Climate Change Plan announced by President Bush in February 2002, calls for a 18 percent reduction of greenhouse gases "intensity " in 2012, which translates into a 14 per cent more greenhouse gases during this period. As pointed out by the US General Accounting Office (GAO) in October, 2003 report, however, the "plan " represents virtually 'business as usual. 'The report states: "While the emissions of greenhouse gases in the United States rose Significantly, the Energy Information Administration of the United States reported that the emission intensity has been generally declining steadily since 50 years. "The Bush Climate Change Plan allows greenhouse gases continue to rise while the long decline in emissions intensity is also continued. Fortunately, the United States Congress are beginning to demand action in the light of the continued blocking of the Bush administration. In the very first Senate vote on a mandate of the American policy cuts greenhouse gases, which took place in October 2003, 43 members of the Senate voted in favor of the measure, with 55 voting members of the objection. The authors of legislation, Senator from Arizona John McCain and Senator Joseph Lieberman of Connecticut have promised to push for another vote on the bill, the Climate Stewardship Act, in 2004, and believe that they may even have enough votes for the measure to pass the Senate. Source: Effect of Global Warming.